The Smoothwall System’s supplied reports are found under the Reports > Reports menu. Those reports available to run are dependant on the Smoothwall System, and licenced modules, installed. All other supplied reports have been deprecated from the Smoothwall System, but remain in the Archive folder for backwards compatibility. For a detailed description of the supplied reports, see Available Reports. A report template is the structure for a supplied report or custom report. You can create custom report templates tailored to your installation. These can be created from scratch, or you adjust the content of the supplied report templates to suit. However, this will create a copy of the supplied report template rather than changing the existing report structure. For a detailed description of how to create custom templates, see Creating Custom Report Templates. When a report is initially generated, it is outputted as HTML-rendered to the screen. 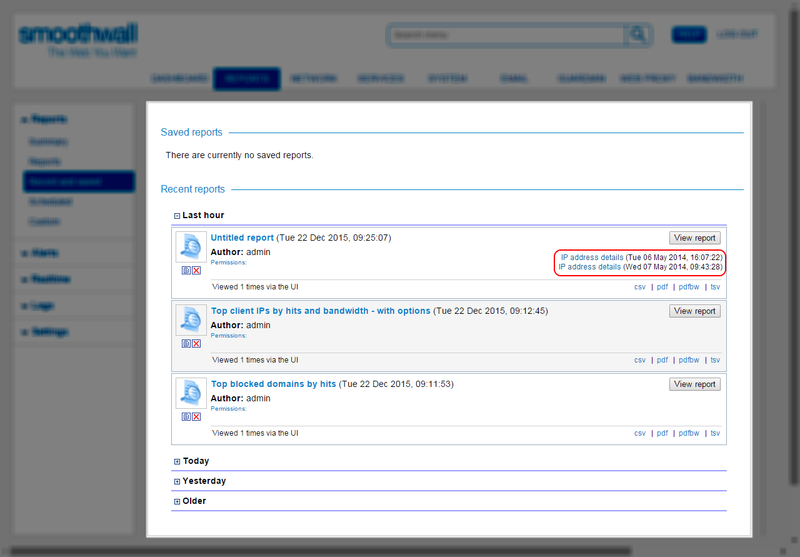 You use the Contents menu for quick and easy navigation to sections within the report. A Back to top quick-link is also provided to reduce scrolling for large reports. Some result data, such as, IP addresses and URLs, can present additional information when hovered over. This is particularly useful where the Smoothwall System has truncated a long URL for display purposes. Note that not all reports and results have this feature. Once generated, you can save the report, change the date range and change the output format. Some supplied reports come with the ability to drill down through the data presented for further investigation. Note that not all reports have this feature. Drill down reports are actually other supplied reports that can be run using the same data. Note: The list of available drilled down reports is determined by the report group and cannot be altered. Note: Drill down reports are not available through the user portal.